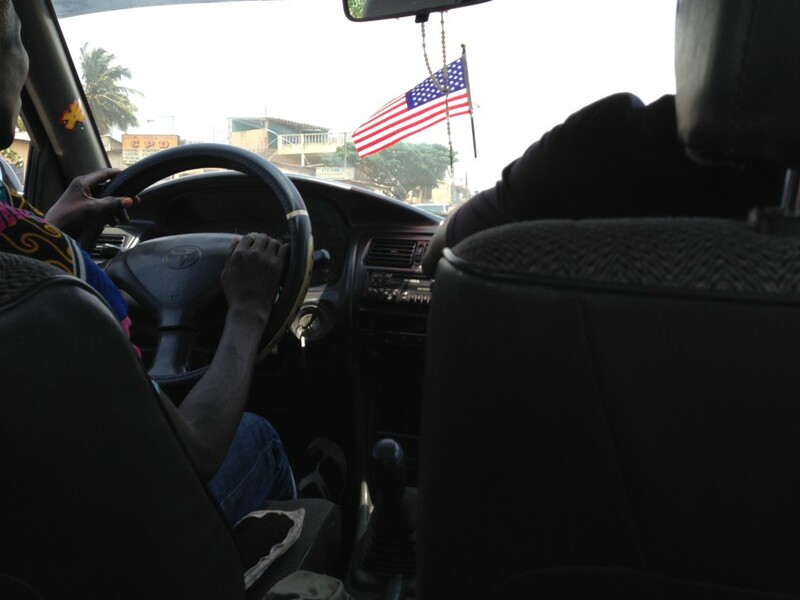 Driver picked me up as promised, and we were off to see more of Niamey. 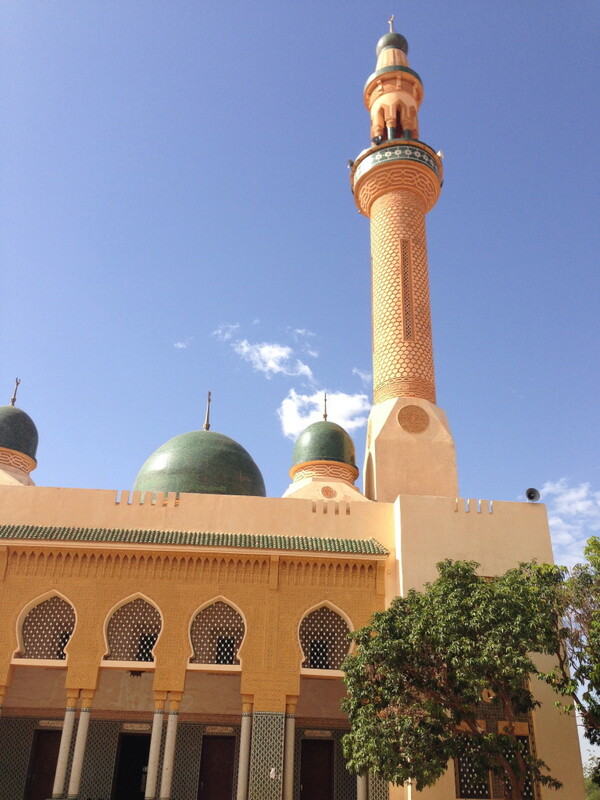 First thing on my agenda was the mosque. Built around 10 years ago, it was a gift from Colonel Qadaffi of Libya when he was in his big rah rah I’m the uniter of the African people phase and was lavishing gifts around the continent. Real sorry how things ended for ya bud…. 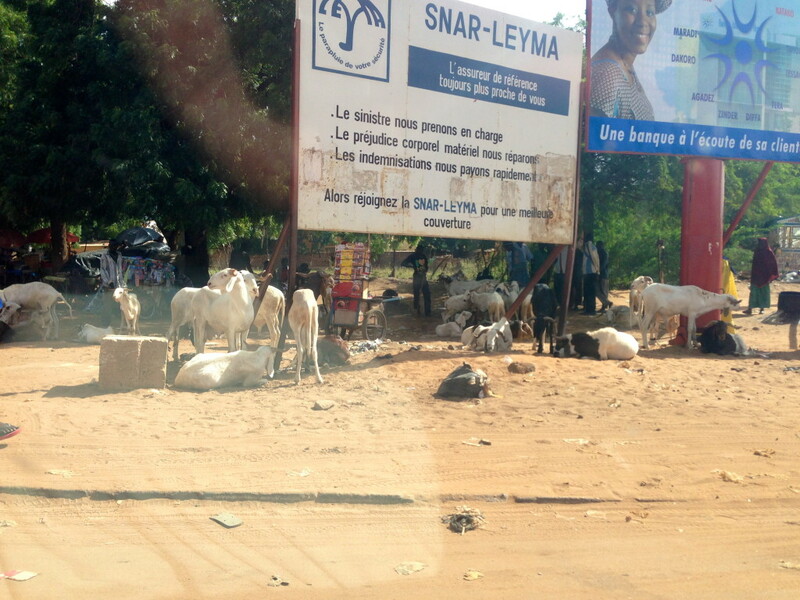 On the way to the mosque, some goats hanging out on the side of the road. 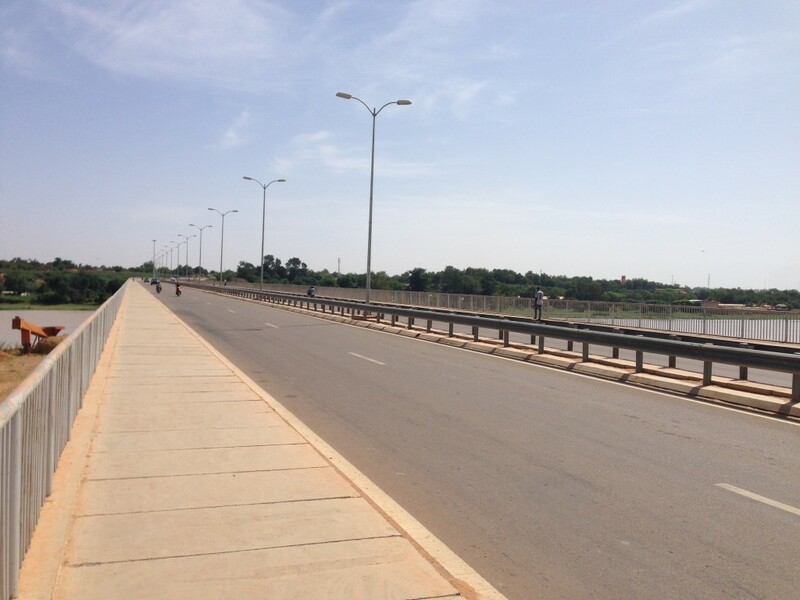 Lots of pics of my day in Niamey, so I’m going to split this day into two parts to make it a bit easier to read. Slept in a bit this morning, and definitely needed it. 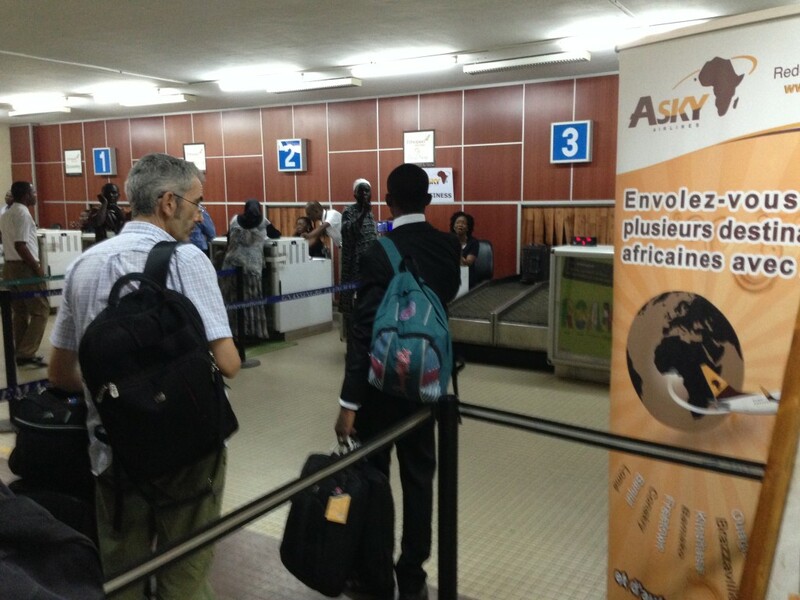 I felt like I’d hit the ground running when I landed in Benin several days prior and hadn’t let up until now. Plus, the room was nice and cool and dark so pretty easy to sleep. Made my way down to the hotel breakfast, and there wasn’t much there except a few baguettes, a jar of store-brand hazelnut spread (aka imitation Nutella) and some instant coffee. It was pretty sad, but I was starving and it was only 3,000 CFA (around $6.50) so I went for it. Plus, it would allow me to wake up in the safe confines of the hotel while coming up with a plan to tackle my day. The strategy was to find a driver who I could hire for the entire day who would take me to the sites I had read about online, as well as show me some things I might not consider. After breakfast, I headed out into the courtyard area of the hotel to hang around and see who approached me. Didn’t take long until one of the guys sitting around under the trees asked if I was looking for a taxi. First strategy “sure, how much would it cost to take me to the museum?” “Hmmm, 10,000 CFA” “That’s pretty steep – let’s say we do that and make it the whole morning, how much then?” “20,000 CFA” You see where this game was going. Finally, I asked him a price for “3 hours in the morning” then “2-3 hours in the afternoon after lunch” and finally take me to dinner, wait, and bring me back. “30,000 CFA.” I knew $65 was a fortune for a day’s work in Niger, but considering I was trusting this guy with perhaps my one and only time ever in Niger it would be worth it. He seemed very happy with the deal, and was very anxious. He didn’t speak a word of English, but was very easy to understand in French, and I feel like even if I overpaid I got some great French and cultural lessons out of it too. 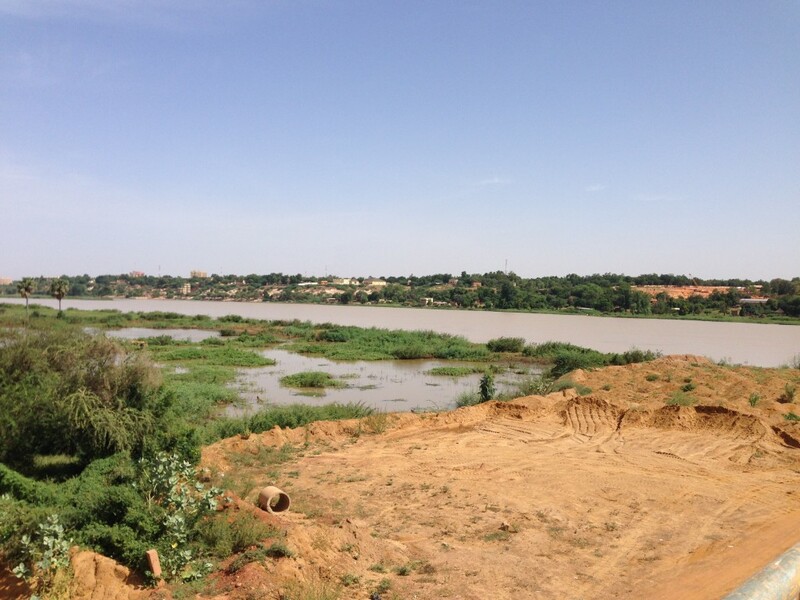 Told him first thing I wanted to see was the Niger River. So off we went. The car even had AC, and he had no problem turning it on. It wasn’t very powerful, but just enough to turn unpleasant, dirty, dusty, smoggy air into mostly clean indoor air. I’ll take it! My driver showed up right on time in the morning, and soon we were off to the airport. About one or two miles into the drive, the car started going slower and slower…and slower…until it completely stopped. I asked what the problem was, and the driver said he didn’t know…but it seemed pretty clear to me that this had happened to him before. He just pulled over to the side of the rode, and flagged down a passing taxi. Finally got to the front of the check-in line, and they said the flight had some problems, and was not open for check-in. Please step aside for 15 minutes. ut oh…are we going to cancel? I went back up to the counter 15 minutes later, and checked in no problem. Who knows what the original drama was about. I know, I know…I’ve gotten way behind. A few weeks ago I was in Nigeria (country #137 visited) for a few days with a friend and I owe a trip report for that one which I promise to get done soon. All in all, it was a great trip! Of course, assuming everything works out….that will bring the total country count up to 143 visited…only 53 to go!